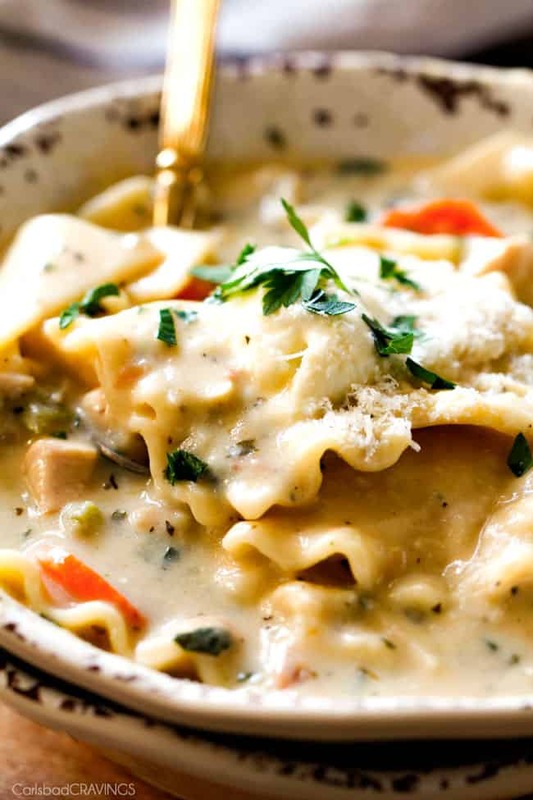 One Pot White Chicken Lasagna Soup is wonderfully creamy, hearty and comforting but so easy – destined to become a new family favorite! 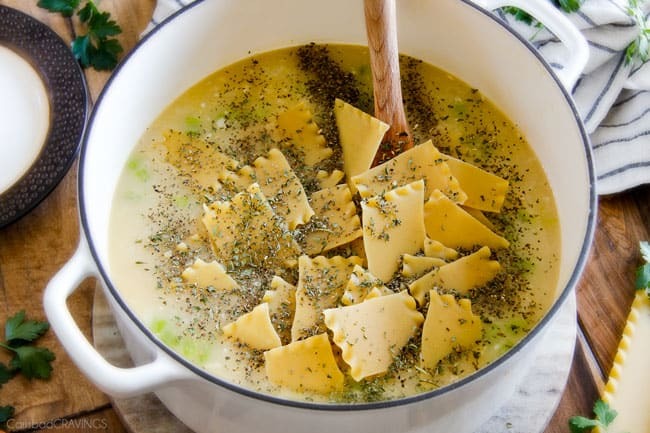 This easy White Chicken Lasagna Soup tastes just like white chicken lasagna with cheesy layers of noodles smothered in velvety Italian spiced Parmesan infused sauce without all the layering or dishes! Simply saute chicken and veggies and dump in all ingredients and simmer away for a pot of velvety, slurpilicoius flavor! So it happened. My Easy One Pot Lasagna Soup joined the 1 Million Pinterest Club along with my Cream Cheese Stuffed Banana Bread Coffee Cake, Chili Lime Chicken Tacos and my Southwest Pepper Jack Salad (2M)! And I must say it is well deserved because that soup is the BOMB with tons of glowing reviews – definitely a readers favorite. If you haven’t tried that One Pot Lasagna Soup yet, please make it this winter because it is SO much easier than traditional lasagna and you will be doing yourself and your whole family a big, comforting cheesy pot of a favor. 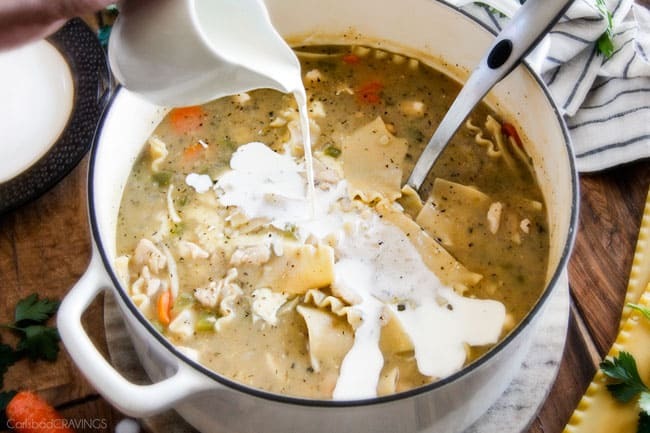 Today’s One Pot White Chicken Lasagna Soup was definitely inspired by my aforementioned Easy One Pot Lasagna Soup, as I use the same technique but I wanted to created a lusciously creamy soup because who doesn’t love creamy soup?! From my Chicken Gnocchi Soup to my White Bean Ham Tortellini Soup to my New England Clam Chowder and White Chicken Chili. creamy soups are the most comforting foods on the planet. 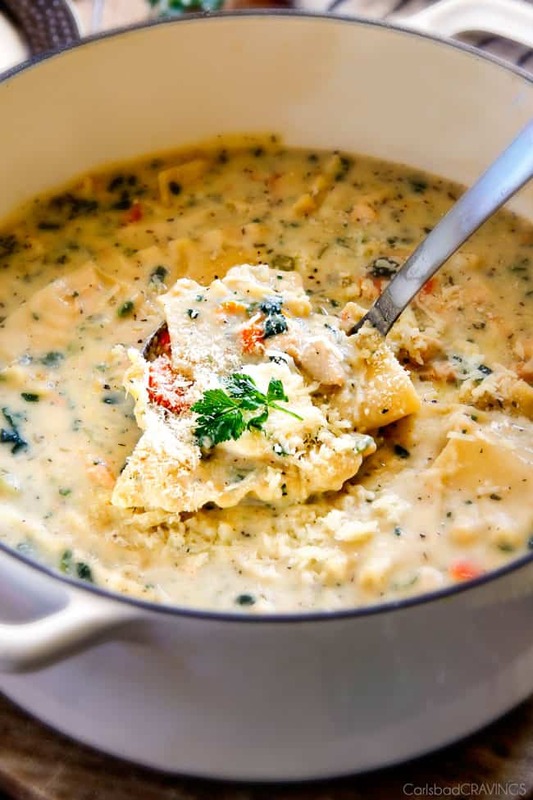 The inspiration for this White Chicken Lasagna Soup more comes from our trip to Cancun. Random, right? A couple years ago, Patrick and I were going to go with my family to Lake Powell. I had been receiving home IV antibiotics through a PIC Line (IV inserted in the upper arm) for pneumonia and so I scheduled to have my line removed a day earlier then we were all going to drive up to Lake Powell that morning together. Unfortunately, I got the call that a family member was sick which meant I would not be going to Lake Powell as I cannot be around anyone who is sick due to being immuno suppressed (due to my lung transplant in 1999, see story HERE). So my hero husband booked us a spontaneous trip to Cancun the next morning. In fact, you can see a pic of my bandaged IV arm in Cancun HERE on IG. So long story made longer, the All Inclusive Resort we stayed at boasted an AH-mazing Italian restaurant with a Bechamel Lasagna that I ordered on TWO separate occasions. 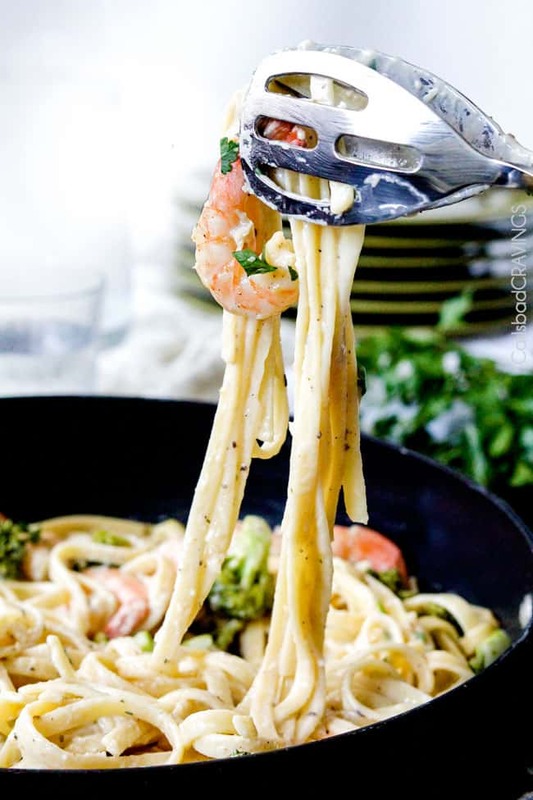 The way the velvety sauce cradled the thin noodles in every comforting bite was dream worthy. And I knew I had to recreate it in one way or another. So this One Pot White Chicken Lasagna is my tribute. And its a good one. Patrick couldn’t stop raving about the cheesy layers of goodness. And I still can’t get over the “can’t-get-any-easier” approach of dumping all the noodles into one pot without the time-consuming, tedious, layering! 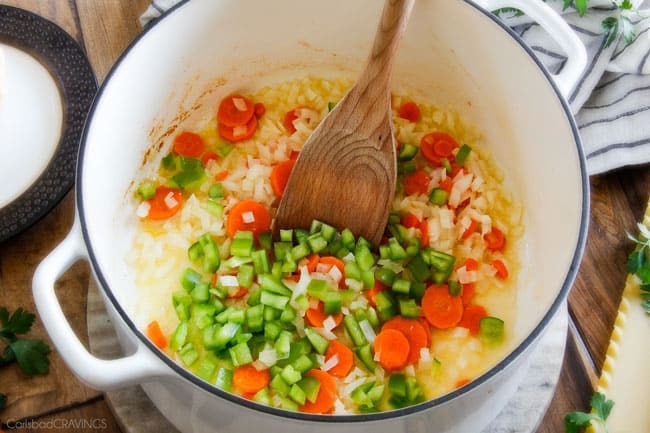 To make your One Pot White Chicken Lasagna Soup, saute your chicken for a couple minutes, then remove to a plate, then saute your onions, carrots, bell peppers and garlic. 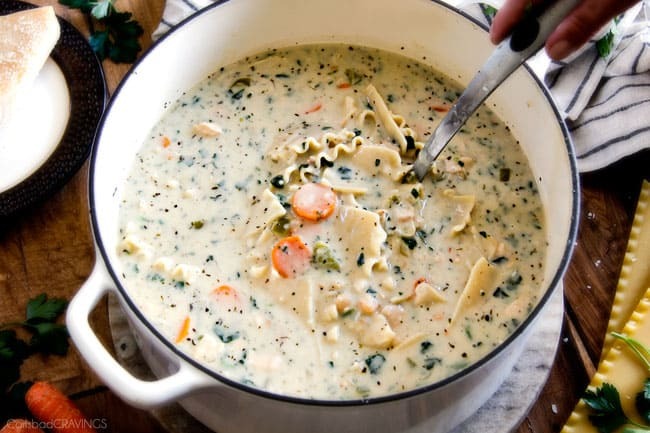 Sprinkle in some flour, cook, then stir in your chicken broth, white beans, and your cast of seasonings including parsley, basil, oregano and thyme because all that liquid cream needs some flA-vor! Next, add your lasagna noodles and simmer away until the noodles are al dente. Next, stir in half and half, optional heavy cream, chopped spinach and warm through. 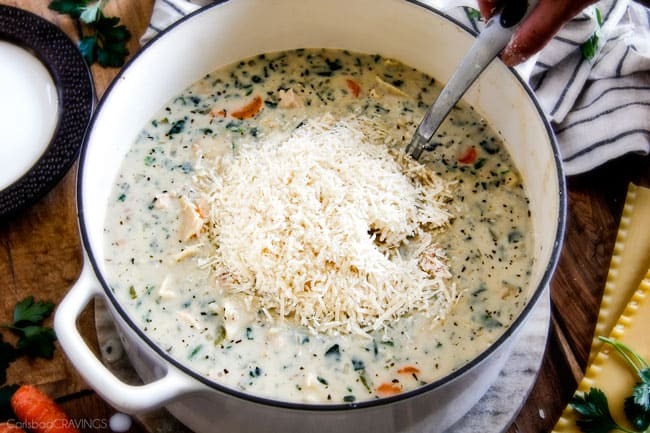 And you are ready to top your individual bowls with shredded mozzarella cheese, freshly grated Parmesan cheese and ricotta cheese– as little or as MUCH as you like! Now the list of ingredients might seem long, but keep in mind you are just dumping and running after a quick veggie saute to let the sauce simmer and cook the noodles while your whole home fills with the tantalizing rich aroma of of one of the most comforting soups you will ever devour, one pot soups. I can never get enough of the texture of the thin al dente lasagna noodles blanketed by Parmesan cream velvety goodness. And I don’t want to. Thank you Cancun. Looking for more One Pot Soups? 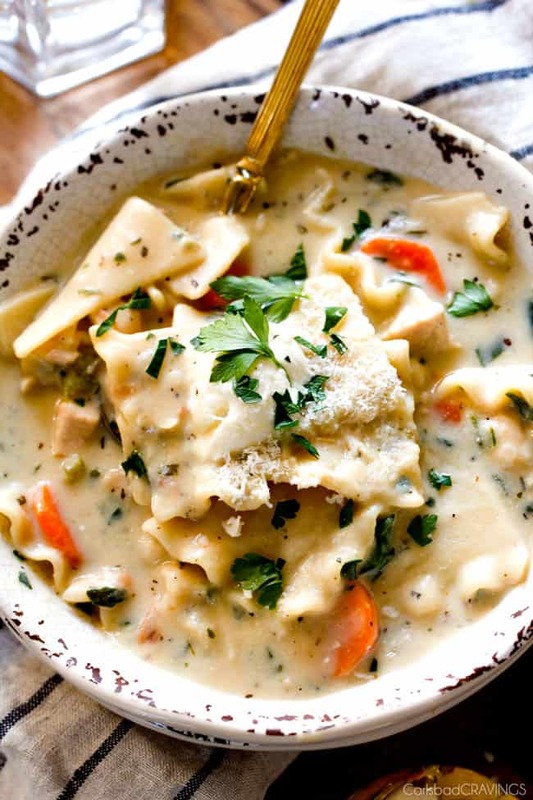 Want to try this White Chicken Lasagna Soup? Pin it to your SOUP, DINNER, or CHICKEN Board to SAVE for later! *I love lasagna noodles in this recipe - they are slurpilicious! Don't worry about them breaking evenly - you won't notice once they cook. You can also replace the noodles with 2 1/2 cups uncooked small shells if desired and simmer for less time. Oh my gosh! 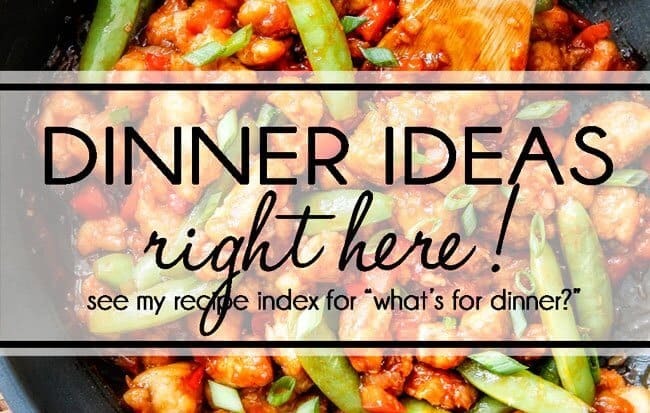 Just made this for dinner and I have to say you nailed it! It was DIVINE! So so good will definitely be a staple in our home! Awesome Michelle, I’m so happy it is a new family favorite! Thank yo so much! You could try it but I haven’t had good experience with noodles cooking evenly in the crockpot. Hi there! It will thicken overnight but simply whisk in some milk or chicken broth when reheatinng and it will be great! How do I get copies of these receipts? Hi Nannette, there is a print button at the very top of the page under the main heading or a print icon in the actual recipe on the top right corner. I hope that helps! Could you use fresh spinach rather than frozen? And could you use shredded chicken rather than chopped? Thank you! Hi Anna! You can definitely use fresh spinach if that is your preference. I would add shredded chicken at the end of cooking just so it heats through and the spinach at the very end as well just so it wilts. Enjoy! Thank you so much!! I am looking forward to making this. Just one more question- if I do not have cannoli beans- is that a crucial part of the recipe? Should I go buy them? Every year for Easter my gift to the members of my family is homemade soup and bread. I think I just found my soup for this year! I’m not even worried that it’s a hearty soup considering we’ve had two Nor’easters in the last couple of weeks and our spring weather hasn’t quite arrived yet. The one change I’m considering is using mafalda instead of the lasagna noodles (since they are sort of like little mini lasagna noodles). I’ll let the soup simmer a while before I add them so they don’t overcook. Thanks for the recipe! I’m really looking forward to making this. Hi Joan, what an amazing gifting tradition – absolutely brilliant! It’s an honor for this soup to be considered! I hope everyone absolutely loved it and that you had a very Happy Easter! It was delicious and everyone loved it! Thank you! You are so welcome! I’m so happy it was a winner! Hi Robbie, generally soups with creamy and cheese don’t freeze well so I don’t recommend freezing it or the texture will get funny. Sorry! You are on the right track! Bouillon cubes or granules are compressed stock that needs to be dissolved before using. It adds tons of extra flavor when added to a soup or sauce. Chicken bouillon can usually be found by the chicken broth. Instead of using regular half and half or non-fat evaporated milk, what do think about using non-fat half and half? My niece tried using the non-fat half and half in a family recipe and it was one big FAIL, This soup looks so good, but I don’t want to ruin it. I’ve made 6 of your recipes now and loved every one of them. Advice please? Hi Ruth, I honestly am not sure because I don’t use non fat half and half, but you could try whisking in 1-2 tablespoons cornstarch into the milk (in additional to the cornstarch already in the recipe). I hope that helps! Delicious Soup! My husband and I both agree we would like this even without the chicken! I added a can of artichoke hearts to make it more like a spinach/artichoke lasagna. Next time I make this I will leave out the chicken and add 2 cans of beans and artichoke hearts. I’m so pleased you loved the soup Debra and I love the idea of more beans and artichoke hearts – yum! 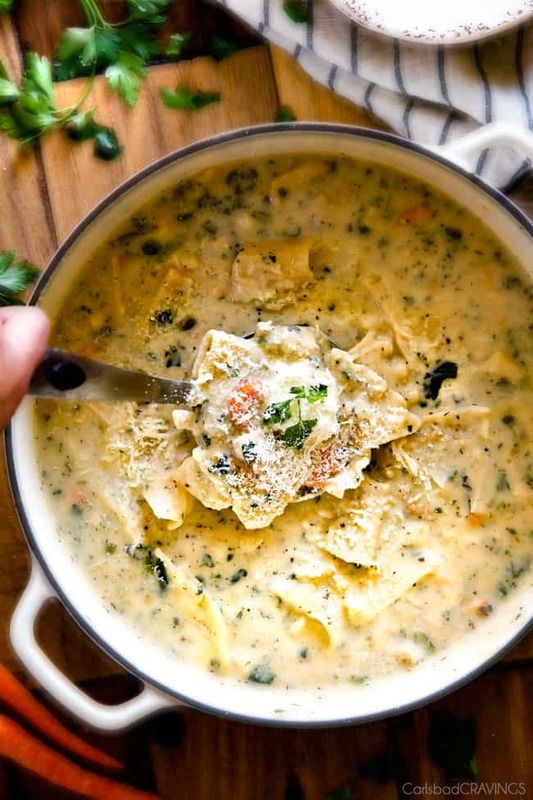 I can’t wait to try this White Chicken Lasagna Soup! It looks delicious! I make another lasagna soup and want to offer a tip for breaking up the lasagna noodles. Instead of trying to break each noodle and having pieces flying in all directions, I put them into a ziploc bag and use the side of a meat mallet to break them up. Thanks so much for the tip Donna, that is a great idea! A 5 star rating recipe! 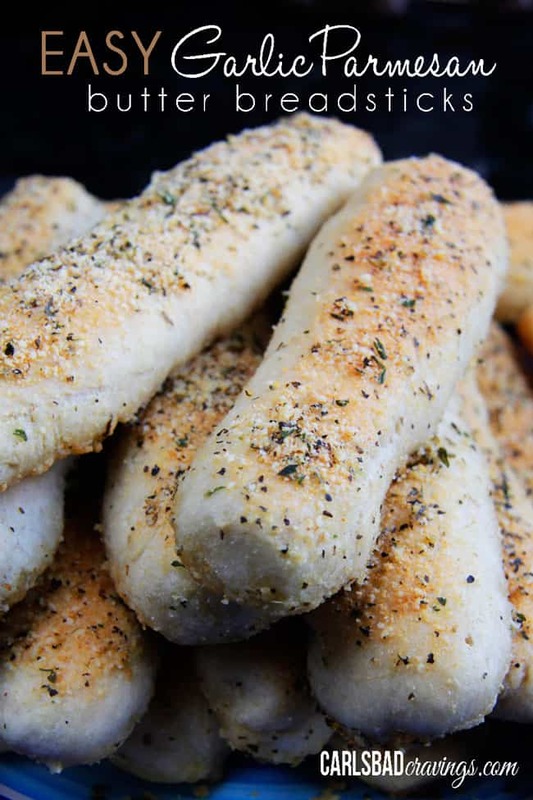 My husband ate so much I had to tell him to stop *grin* Absolutely delicious and incredibly easy to make. Well done, Jen, for another great recipe. Keep up the good work. Thanks so much for your awesome comment Lydia, I’m thrilled it was a runaway hit!